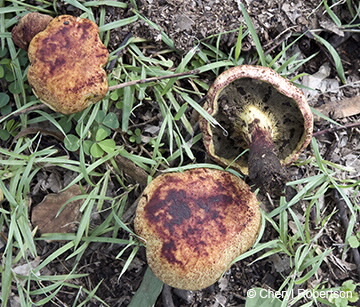 These mushrooms were found growing in a Eucalyptus platyphylla woodland. Cap convex expanding with age, to 7 cm diameter and 2 cm deep, has dark red patches and paler patches on top becoming yellowish-green towards the margins. 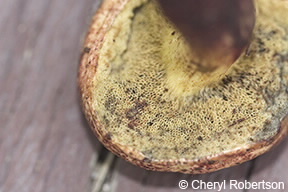 Lower surface with yellowish-green, thick-walled pores 2-3 per mm. Stem reddish, bulbous base, to 6 cm long and 1.2 cm wide, tissues loosely packed. All cut or wounded surfaces quickly change colour from yellowish to dark green/blue. Edibility unknown, some in genus are poisonous.